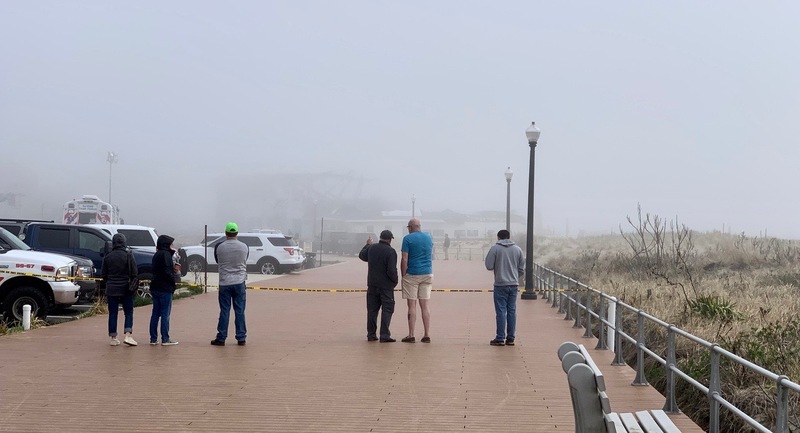 White Whale hulk enshrouded in fog and questions on the morning after…. 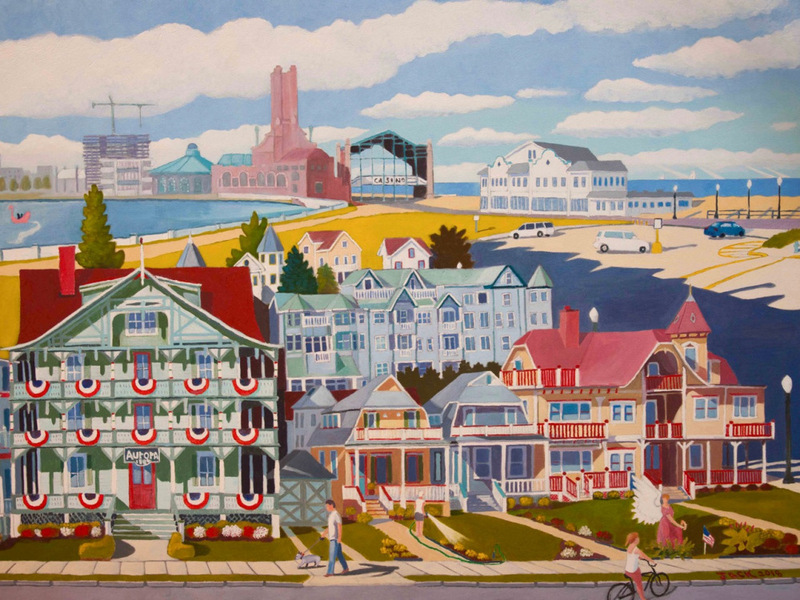 By Jack Bredin and Paul Goldfinger, Blogfinger.net, Ocean Grove, NJ. 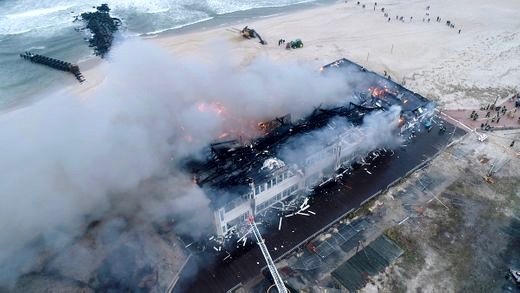 It’s Sunday, April 14, 2019, one day after the White Whale (Dunes) building was destroyed in a 5 alarm blaze. The entire North End had been filled with fire-fighting equipment during the conflagration, and many fire trucks could not get near the fire. Equipment came from many nearby communities, but there was no easy way to go in and then turn around, and many of those units were useless due to the congestion. Sirens were heard for hours, and smoke enveloped the region afterwards. Luckily there were no major casualties. At first, the OG Fire Department thought the building could be saved, but after the roof collapsed, the building was seen as a total loss. 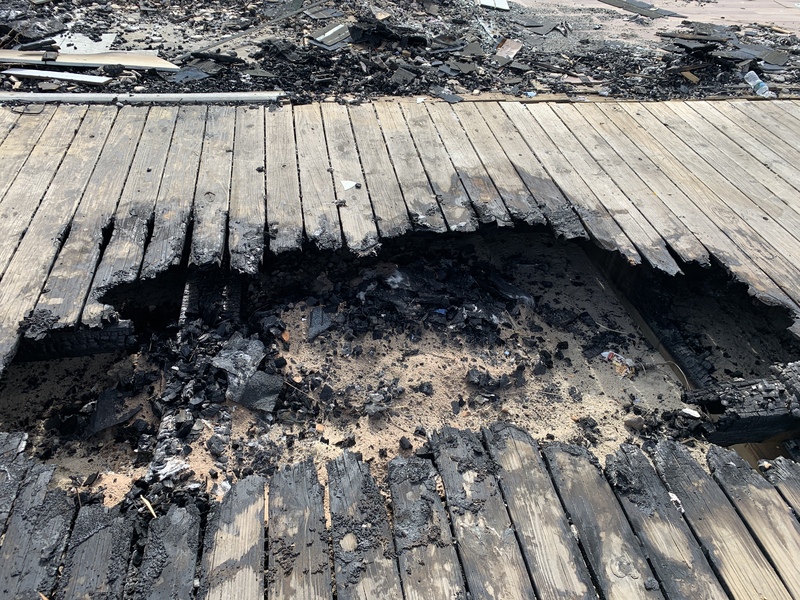 Water was pumped from Wesley Lake, because there were no hydrants or a water main near the building, and the structure sat on the boardwalk and the sand. That building does not front on a street, and the Lake is not a convenient location as far as getting water to the rear of the building which was where the fire seemingly began, in the crawl space below the food court. These conditions hampered the work of those brave firemen. One miracle was noted when about 6 firemen were up on the roof when the Fire Chief decided that the situation was too risky. They were told to retreat just in time, right before flames enveloped the roof, causing it to suddenly collapse. If they had stayed there, they would likely have not survived Thank goodness for that decision by the fire command. The White Whale building (BF nickname) had been built in 1909 using balloon construction which promotes rapid acceleration of flames during a fire. 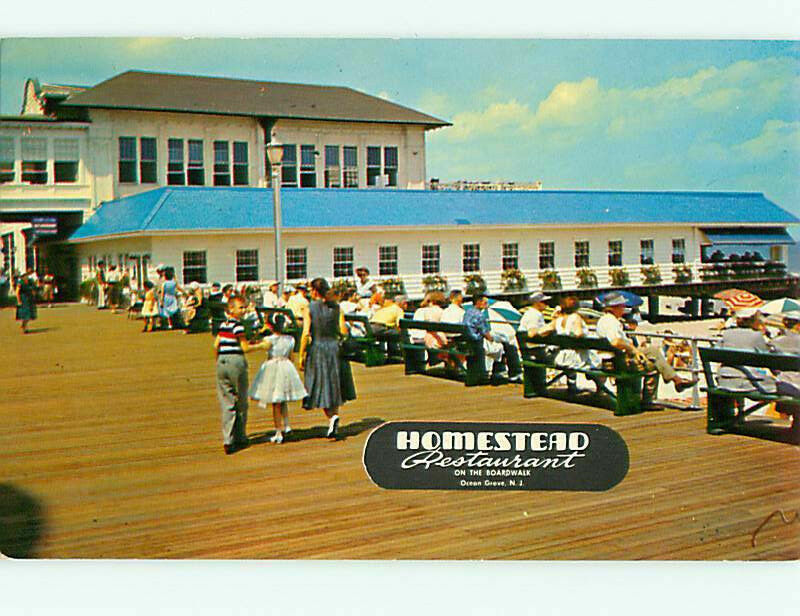 It was built on the beach and the boardwalk as a pavilion–for recreation purposes only. You could purchase some snacks and souvenirs there. Later a restaurant addition was built, housing a diner that stood for years and most recently as a food court with 8 businesses. 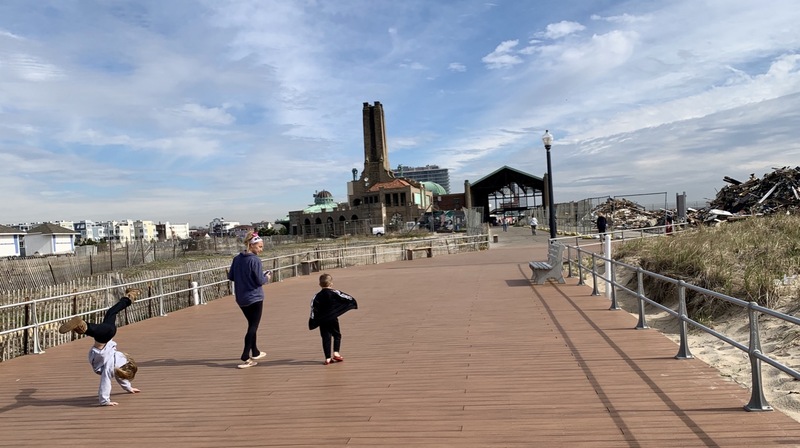 The Neptune tax collector had given that section an address of #4 North End Boardwalk, even though the building did not exist on an actual street. In 2012 Sandy caused extensive damage to the White Whale. A FEMA inspector happened to come by to check the damage and he was heard to say that the Whale sustained more damage than most buildings which were demolished after Sandy. He said that it should be torn down. 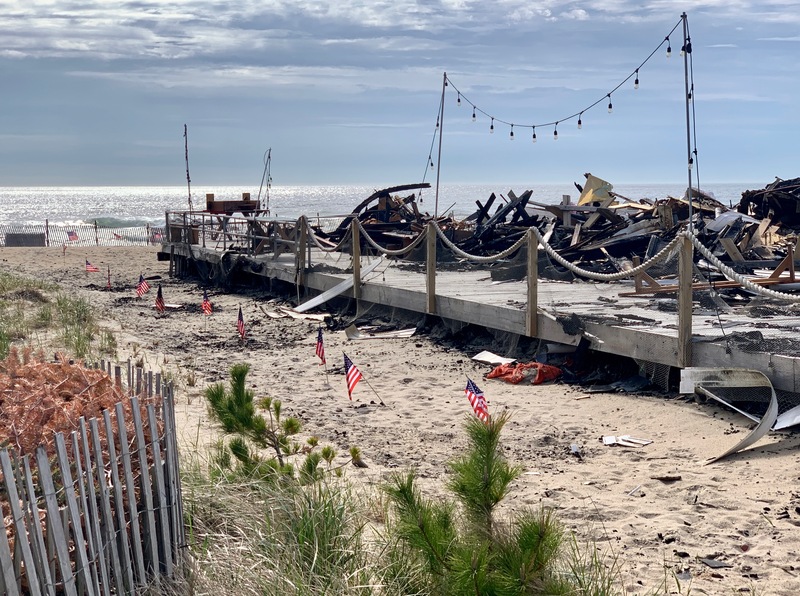 The Neptune Township Building Department did not give the owner, Maplewood Ocean Grove Associates, Inc, a building permit to make repairs, but as work began, the OGHOA complained that there had been no building permit issued. However the Groaners evidently weren’t knowledgeable enough to demand that no building permit should be issued and that the building ought to be condemned. Later the permit was granted. One reason why a permit should not have been approved is because a building permit cannot, according to State law, be issued for a structure that is not on a street. The Boardwalk is not a street, nor is Lake Avenue.The original North End redeveloper planners who said that it was a street were wrong. In addition, any permit then should have demanded that fire hazards be corrected throughout the entire building. The risk of fire was also increased due to the absence of fire hydrants and a water main line over there. And, a permit should have been withheld due to the absence of a turnaround for fire trucks which were rumbling over to the site, but then unable to retreat yesterday. Had the Township withheld that permit in 2012, this fire would not have happened. It would have been an empty lot yesterday. This is totally a failure of Neptune Township to protect Ocean Grove. If they had been strict with the owner, he would have probably chosen to demolish the building himself due to the cost. Incidentally, those heavy trucks were positioned at the North End Redevelopment site, a place where parking had been denied by the CMA for fear of collapse. All those trucks did not cause a collapse yesterday. In 2007, When the North End Redevelopment Plan was designed and approved by two licensed planners and the Neptune Planning Board, no one took note of the existing concerns about fire safety at that building. Neptune Township allowed a vulnerable situation to persist and they bear some responsibility for the fire and for the difficulties fighting the fire yesterday. As for the zoning, it is now “mixed use” thanks to the manipulative favoritism in town which allowed the designation of a “Zone in Need of Redevelopment.” Now that site will be empty awaiting the finalization of a North End Plan. At one point, a few years ago, Randy Bishop was quoted as saying that the Whale would become a 4 story building with condos, a banquet hall, and shops. Later he denied saying that. If the Plan is changed to show condos, banquet hall, and shops at that location on the beach, a revolution should occur.